Dave Mason has been a force to be reckoned with since birth. A home birth on May 10, 1946, in Worcester, England, David Thomas Mason weighed in at 11 1/2 pounds. His only sibling, his sister Valerie, was 17 years his senior. His parents owned a candy store called E. Masons, and later an ice cream factory. His father also spent quite a bit of time at the horse races, a pastime Dave enjoys when he can find time to attend the track in between his busy touring schedule. Dave's determination and strong will can perhaps be traced to a little known, but monumental incident which took place at the age of 5. In the adjoining stables, Dave went in search of a toy pedal car his parents had stashed in a ceiling loft. Dave missed a step when reaching for the car and fell 20 feet to the hard floor. Initially it appeared he was unscathed, but a few days later it was revealed he had bent, not broken, a hipbone, and because of the intense trauma to the hip, contracted a condition called Perthes syndrome. Dave was treated at Aston Hall, the leading medical authority for orthopedics, for more than 18 months, which included nine months of being held in traction by strapping him to a metal board. Once released from the board, Dave underwent intensive physical training, as he had to learn how to walk all over again. Dave's initial dream was to become a member of the Royal Air Force. Yet at an early age, Dave's talents and strength showed up more in creative endeavors. At 16 he began to play guitar and sing, and by 17 became a working musician in his first band called The Jaguars. The next year, he formed The Hellions, where he struck up a lifelong friendship with Jim Capaldi. They penned their first song together here called "Shades of Blue", and made a recording with Pye Records with this tune on the B side. The A side was a Jackie DeShannon song called "Daydreaming of You". The recording was produced by Kim Fowley, an eclectic man who had a hit novelty song called "They're Coming To Take Me Away". Capaldi and Mason continued their work together, forming another group called The Deep Feeling. Shortly thereafter, music history takes place. Through Dave's friendship with JIm Capaldi, Dave met Steve Winwood and Chris Wood. The four joined forces to form what is considered one of the most influential bands of all time, Traffic. Traffic operated on the cutting edge of the late-sixties music scene at a time of rapid and remarkable evolution, and expanded rock's sonic palette. But whereas most progressive British bands were based in London, Traffic retreated to a secluded cottage in the countryside. A key component of Traffic's mythology is their communal stone cottage in Berkshire. It was here the group wrote and rehearsed material for Mr. Fantasy, and Traffic, among the more remarkable albums of the sixites. The group's first single was the Winwood/Capaldi composition "Paper Sun" followed in August 1967 by Mason's "Hole in My Shoe" which hit number two in the U.K. Mason also appeared in the debut album, Mr. Fantasy. His whimsical melodies and goodtime feel, incorporating simple yet rich lyrics, ensured a delightful contrast. His vocals adding a mellower texture to Winwood's, and an extra interest. His three tracks, "Utterly Simple", "House for Everyone", and 'Hope I Never Find Me There" having instant appeal. The latter relating more closely to the group's contributions. Mason became recognized for his obvious virtuosity on sitar, vocals, and guitar. Artistically Mason had started the process of establishing himself. Like Winwood, he was a musical perfectionist, but their approaches were different. Rather than follow his ideals which would estrange him from the band, he decided to quit, even before the first album was released in December 1967 he left the band. He recorded a solo single, "Little Woman", released by Island in early 1968. The B side "Just for You" subsequently appeared as the opening track of "Last Exit". In pursuit of a solo career, Mason moved to the US, an environment particularly conducive for his creative talents, but when Traffic arrived there for their first tour in March, he rejoined Traffic with a handful of songs. "Feelin' Alright" was released as the first single off the second album, Traffic in October 1968. Mason's journey with Traffic was fitful, yet fruitful. Not quite a month after the release, Mason left the band again and it broke up shortly afterward. Steve Winwood joined the band Blind Faith, Mason Capaldi, and Wood teamed with Mick Weaver in the short-lived Wooden Frog. Traffic was inducted into the Rock and Roll Hall of Fame in 2004. Unencumbered by a commitment to a band in Engand, Mason moved to Los Angeles and joined Delaney & Bonnie & Friends in 1969. He played lead guitar and toured with them opening for Blind Faith. Delaney & Bonnie had a #2 hit with Mason's song "Only You Know and I Know". In 1970 he signed a solo contract with Blue Thumb Records, and began cutting his debut solo album, co-producing it with Tommy LiPuma. "When we got together, and he played me lots of the stuff from the album, the material was just ridiculous," meaning ridiculously good. "He had just bought a 12-string, and he was realy in love with it. The songs were just so strong, forget it. You had to be deaf not to hear it." The first result of the sessions was a single, "World in Changes", released in April 1970, followed by the full album, the classic Rock n' Roll masterpiece and enduringly powerful Alone Together in June. The album reached the Top 25, stayed in the charts six months, and went gold, while a second single, "Only You Know and I Know" became a Top 40 hit. His next career move always seems puzzling, but it shouldn't. One of Mason's earliest friends in Los Angeles was Mama Cass Elliot, and in 1970 they formed a duo, which they launched with a performance at the Fillmore East in New York in September, and in the next year released the album Dave Mason and Cass Elliot. The duo was short lived, Mason briefly hooked up with a new configuration of Traffic, doing only six shows yet culled the live album, "Welcome to the Canteen", where we hear a live version of "Feelin' Alright", and "Sad and Deep as You". After the shows, Mason stayed back in England and was an original member of Derek and the Dominos with , prior to Layla. Dave was replaced by Duanne Allman. Meanwhile, Mason became Blue Thumb's most successful recording artist. As was commonplace, he was asked to renegociate his contract. When Blue Thumb demurred, he stopped working on his follow up to Alone Together, sued the label, and took the tapes he had recorded so far. Blue Thumb still had two-track copies of the material and released them as "Headkeeper" in 1972, and Dave Mason is Alive in 1973. Mason denounced them as bootleg, and was forced into bankruptcy. Yet it freed him from Blue Thumb, and he signed then with Columbia. The Columbia relationship was wildly successful, with two albums going gold, Mariposa del Oro, and Dave Mason, followed by Let It Flow going Platinum, and including the classic "We Just Disagree" which became a top 20 hit. In addition, Mason became a huge success as a major concert attraction, playing venues such as Red Rocks, Madison Square Garden, and the Los Angeles Forum during the 1970's. His brand of melodic mainstream rock had fallen from favor by the start of the 80's, when his Columbia contract expired. He stayed on the road in spite of it becoming a difficult time for him personally. "I didn't even pick up a guitar for a year. I stopped writing. I had my bouts with drugs and alcohol, and I really needed to get away to see when I wanted in life." Finally, he cut the album Some Assembly Required, which was released by Maze Records of Canada in 1987, then hooked up with the Voyager label, distributed by MCA for Two Hearts, released at the end of the same year. Mason continued to perform, suffering a great blow when his long time colleague and friend Jim Krueger died in 1993. Shortly after, he joined a new lineup of Fleetwood Mac in 1994 and 1996. The group toured, then recorded the album Time, released in 1995, which included two songs co-written by Mason. By any measure Dave Mason has had a full life, difficult enough to have discouraged a less determined man and to have defeated a less talented one. It was always Mason's musical ability, as a writer of classic songs and a stunning performer able to attract a loyal following that has kept him afloat personally and professionally. He has always loved the music. As Bill DeYoung in Goldmine Magazine writes, "Mason made one bad business move after another, picking the wrong managers, signing the wrong contracts. He had the usual problems with drugs and alcohol, and with relationships with lovers, and band members, but at the end of the day, as always, it was the music that mattered." In a 2011 interview Mason said, "Living is definitely not for the weak or faint of heart; its a constant work in progress". And so Mason continues to follow his heart's calling. He continues to hold considerable weight in the industry as one who carries a powerful legacy and indelible mark on Rock and Roll. Not many music legends in their 60's create and perform with the same energy and vitality that defined their early days. Dave Mason is a rare exception. He enjoys a zest for live performances in addition to a ceaseless ethic of writing and recording. In 2008 he released 26 Letters, 12 Notes, his first album release in more than 20 years. 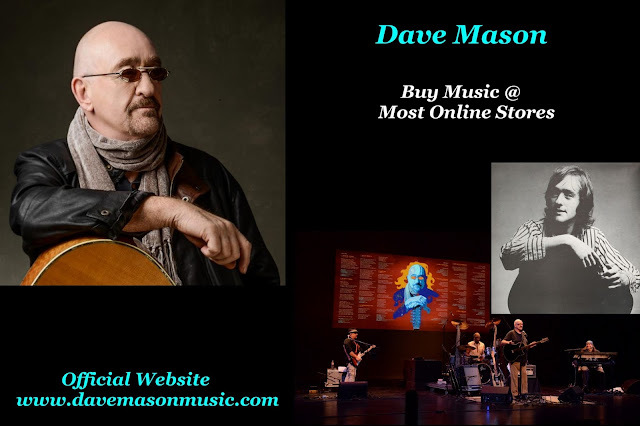 With today's technology supportive of his entreprenurial spirit, Mason is begining to release heretofore private recordings, revealing yet again a new phase in the dazzling career of Dave Mason. 2002 - Dave Mason: Live at Sunrise. 2002 - Live at Perkins' Palace! 1973 - Dave Mason Is Alive! In addition to a rich career in songwriting and performing, Dave Mason was invited to perform on several albums of some of the most legendary names in music. Traffic operated on the cutting edge of the late-Sixties music scene at a time of rapid and remarkable evolution. Along with such kindred spirits as Cream and the Jimi Hendrix Experience, Traffic expanded rock’s sonic palette. But whereas most progressive British bands were based in London, Traffic retreated to the British countryside. A key component of Traffic’s mythology is their communal stone cottage in Berkshire, where the group could soak up bucolic inspiration and work without distraction. It was here the group wrote and rehearsed material for Mr. Fantasy and Traffic, among the more remarkable albums of the Sixties. Those albums were early chapters in what turned out to be a fitful yet fruitful career. The Traffic story is marked with breakups, reunions and personnel realignments. Between 1967 and 1974 they had as few as three and as many as seven members. However, the group always revolved around the trio of keyboardist/guitarist Steve Winwood, drummer Jim Capaldi (drums, vocals) and hornman Chris Wood. And despite the changes, they remained one of the most organic bands of the rock and roll era. A union of musicians from Birmingham, in the British midlands, Traffic was designed to be experimental and open-ended. Yet because they all loved blues, soul and jazz, their foundations made them accessible, as well. As vocalist and organist with the Spencer Davis group, Winwood had already tasted pop success with such soul-tinged pop hits as “Keep On Running” (#1 U.K.., #76 U.S.), “Somebody Help Me” (#1 U.K., #47 U.S.), “Gimme Some Lovin’” (#2 U.K., #7 U.S.) and “I’m a Man” (#9 U.K., #10 U.S.). Winwood was only 15 when he joined the Spencer Davis Group with his older brother Muff, who played bass. Having turned 18 in the heady year of 1967, the precocious teenager wanted to explore the more creative side of the burgeoning music scene and his own far-ranging interests in jazz, blues, rock and skiffle. He joined forces with Capaldi and Wood, late of Deep Feeling, a Birmingham-based psychedelic group. The fourth member was Dave Mason, who’d been a Spencer Davis Group roadie. It was a potent union of talented, visionary musicians. Even in his teens, Winwood’s voice bore hints of Ray Charles soulful fire, and he could play a variety of instruments. Capaldi was a powerful drummer and adroit lyricist. Chris Wood’s reeds brought a jazzy, exotic flavor to the music. Mason was a fluid guitarist and superb songwriter. Capaldi conjured the name Traffic while standing on a streetcorner, and he catalyzed the group’s formation. Traffic’s third single, “Here We Go Around the Mulberry Bush” (#8 U.K.), was the title track for an obscure movie. Their first album, Mr. Fantasy, appeared in 1968. The British and American versions differed markedly, from their covers to the music inside. In the U.S., two cuts were dropped and four others added, and the running order was radically rearranged. Both versions had “Dear Mr. Fantasy” - a smoldering union of soul and psychedelia - in common. Traffic’s experimental chemistry flowered in the countryside, and they paid tribute to the rural environment that sustained them in “Berkshire Poppies.” “We try to get as much color into our lives as possible,” the group said of life in their beloved stone cottage. “We see movements and roam through the temple of our minds.” The group applied such outré touches as sitar and backwards drum tracks to cuts like “Hole in My Shoe” (#2 U.K.) and “Paper Sun” (#5 U.K.), which were both big hits in their homeland. In America, by contrast, Traffic was the consummate album band, never charting a Top Forty single. All through this period, Mason was an on-again, off-again member who wasn’t even pictured on the American version of Mr. Fantasy. Musical wanderlust drew Winwood away in 1969, when he joined Eric Clapton and Ginger Baker (of Cream) and bassist Ric Grech (of the British group Family) in the short-lived supergroup Blind Faith. A third Traffic album, Last Exit, was assembled from non-album singles and live recordings. The group proved to be a phoenix, however, reassembling sans Mason to record John Barleycorn Must Die (1970), their highest-charting album (#5). It was highlighted by the haunting title track, a traditional British folk song; the funky instrumental “Glad”; and the stormy “Freedom Rider,” whose urgency and drive captured Traffic at its best. Mason briefly rejoined for a half-dozen British concerts, from which Welcome to the Canteen (1971) – which included the old Spencer Davis Group hit “Gimme Some Lovin’” – was culled. For its next chapter, Traffic grew in size. Musicians who passed through the band in the early Seventies included bassist Ric Grech, African percussionist Reebop Kwaku Baah, drummer Jim Gordon, and David Hood and Roger Hawkins of the Muscle Shoals Rhythm Section. The early Seventies yielded Low Spark of High-Heeled Boys (1971), Shoot Out at the Fantasy Factory(1973), and the live On the Road (1973). The brooding, jazzy “Low Spark of High Heeled Boys” - which ran for over 11 minutes - triggered Traffic’s greatest popularity. Low Spark sold over a million copies as Traffic became one of the darlings of album-oriented radio. Yet Winwood came to feel the group had run its course, and Traffic gave its last performance on August 31, 1974. Having contracted to a four-piece band - Winwood, Capaldi, Wood and bassist Rosko Gee - they cut one more studio album, When the Eagle Flies (1974), before calling it a day. Winwood and Capaldi thereafter pursued solo careers. Chris Wood died in 1983 after a long illness. The book on Traffic seemed to be closed, but then Winwood and Capaldi teamed up in the early Nineties, tapping into the group mystique one more time for an album, Far From Home (1994), and tour. At some stops they opened for the Grateful Dead. Winwood has spoken about what made Traffic unique and different. “We just wanted to make music that had our own freedom and was more natural,” he said. “If we wanted to do a nine-minute song, we’d do a nine-minute song. If we wanted a two-and-a-half-minute intro before the vocal came in, or if the hook didn’t come in until five minutes into the song, we didn’t care about it.” By caring more about music than commercial considerations, Traffic tapped into a magical motherlode. World United Music (W.U.M.) is dedicated to promoting a variety of music by Independent, Signed, and Unsigned artists. The goal of this project is to help new artists gain recognition for their music by Fans across the World while also offering additional support to established artists that continue to create. World United Music gathers the very best music right here in one place to help you the listener discover what you've been missing. If you like what you hear, please share the site with friends because every share you make, brings an artist new fans...and that is what it's all about. Remember, music is the peoples voice, so the power to change the World is really in your hands. "Catch the Wave" share away and remember, "The Revolution begins with music".